Fakhrzad, M., Goodarzian, F., Golmohammadi, A. (2019). Addressing a fixed charge transportation problem with multi-route and different capacities by novel hybrid meta-heuristics. 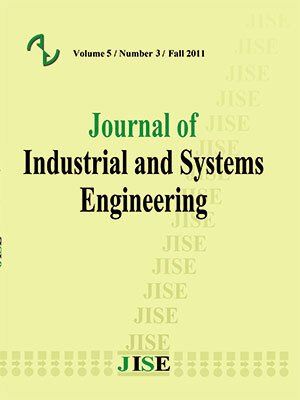 Journal of Industrial and Systems Engineering, 12(1), 167-184. Mohammad Bagher Fakhrzad; F. Goodarzian; A. M. Golmohammadi. "Addressing a fixed charge transportation problem with multi-route and different capacities by novel hybrid meta-heuristics". Journal of Industrial and Systems Engineering, 12, 1, 2019, 167-184. Fakhrzad, M., Goodarzian, F., Golmohammadi, A. (2019). 'Addressing a fixed charge transportation problem with multi-route and different capacities by novel hybrid meta-heuristics', Journal of Industrial and Systems Engineering, 12(1), pp. 167-184. Fakhrzad, M., Goodarzian, F., Golmohammadi, A. Addressing a fixed charge transportation problem with multi-route and different capacities by novel hybrid meta-heuristics. Journal of Industrial and Systems Engineering, 2019; 12(1): 167-184. In most real world application and problems, a homogeneous product is carried from an origin to a destination by using different transportation modes (e.g., road, air, rail and water). This paper investigates a fixed charge transportation problem (FCTP), in which there are different routes with different capacities between suppliers and customers. To solve such a NP-hard problem, four meta-heuristic algorithms include Red Deer Algorithm (RDA), Stochastic Fractal Search(SFS), Genetic Algorithm (GA), and Simulated Annealing (SA) and two new hybrid meta-heuristics include hybrid RDA & GA (HRDGA) algorithm and Hybrid SFS & SA (HSFSA) algorithm are utilized. Regarding the literature, this is the first attempt to employ such optimizers to solve a FCTP. To tune up their parameters of algorithms, various problem sizes are generated at random and then a robust calibration is applied by using the Taguchi method. The final output shows that Simulated Annealing (SA) algorithm is the better than other algorithms for small-scale, medium-scale, and large-scale problems. As such, based on the Gap value of algorithms, the results of LINGO software shows that it reveals a better outputs in comparison with meta-heuristic algorithms in small-scale and simulated annealing algorithm is better than other algorithms in large-scale and medium-scale problems. Finally, a set of computational results and conclusions are presented and analyzed. Baidya, A., Bera, U. K., & Maiti, M. (2017). Models for solid transportation problems in logistics using particle swarm optimisation algorithm and genetic algorithm. International Journal of Logistics Systems and Management, 27(4), 487-526. Baidya, A., Bera, U. K., & Maiti, M. (2016). The grey linear programming approach and its application to multi-objective multi-stage solid transportation problem. OPSEARCH, 53(3), 500-522. Chopra S. Meindl P., Supply Chain Management, Pearson, 4th edition, (2010), 978-0-130608040-4. Chopra, S., Meindel, P. (2007). Supply chain management: Strategy, planning and operation, Pearson Prentice Hall. EL IDRISSI, A. L., TAJANI, C., & SABBANE, M. (2017). NEW CROSSOVER OPERATOR FOR GENETIC ALGORITHM TO RESOLVE THE FIXED CHARGE TRANSPORTATION PROBLEM. Journal of Theoretical & Applied Information Technology, 95. Engin, O., Ceran, G., & Yilmaz, M. K. (2011). An efficient genetic algorithm for hybrid flow shop scheduling with multiprocessor task problems. Applied Soft Computing, 11(3), 3056-3065. Fakhrzad, M.B., A. Sadri Esfahani, (2013a). Modeling the time windows vehicle routing problem in cross-docking strategy using two meta-heuristic algorithms. International Journal of Engineering-Transactions A: Basics 27 (7), 1113. Fakhrzad, M. B., Sadeghieh, A., & Emami, L. (2013b). A new multi-objective job shop scheduling with setup times using a hybrid genetic algorithm. Fakhrzad, M.B., Heydari, M., (2008). A Heuristic Algorithm for Hybrid Flow-shop Production Scheduling to Minimize the Sum of The Earliness ANDF Tardiness Costs. Journal of the Chinese Institute of Industrial Engineers. 25 (2), 105-115. Fard, A. M. F., & Hajiaghaei-Keshteli, M. (2018). A bi-objective partial interdiction problem considering different defensive systems with capacity expansion of facilities under imminent attacks. Applied Soft Computing, 68, 343-359. Fard, A. F., & Hajiaghaei-Keshteli, M. (2016). Red deer algorithm (RDA); a new optimization algorithm inspired by red deer's mating. In International Conference on Industrial Engineering, IEEE., (2016 e) (pp. 33-34). Fathollahi-Fard, A. M., Hajiaghaei-Keshteli, M., & Tavakkoli-Moghaddam, R. (2018a). The Social Engineering Optimizer (SEO). Engineering Applications of Artificial Intelligence, 72, 267-293. Fathollahi-Fard, A. M., & Hajiaghaei-Keshteli, M. (2018b). A stochastic multi-objective model for a closed-loop supply chain with environmental considerations. Applied Soft Computing, 69, 232-249. Fathollahi-Fard, A. M., Hajiaghaei-Keshteli, M., & Mirjalili, S. (2018c). Hybrid optimizers to solve a tri-level programming model for a tire closed-loop supply chain network design problem. Applied Soft Computing. Fathollahi-Fard, A. M., Hajiaghaei-Keshteli, M., & Mirjalili, S. (2018d). Multi-objective stochastic closed-loop supply chain network design with social considerations. Applied Soft Computing, 71, 505-525. Fathollahi-Fard, A. M., Hajiaghaei-Keshteli, M., & Tavakkoli-Moghaddam, R. (2018e). A bi-objective green home health care routing problem. Journal of Cleaner Production, 200, 423-443. Golmohamadi, S., Tavakkoli-Moghaddam, R., & Hajiaghaei-Keshteli, M. (2017). Solving a fuzzy fixed charge solid transportation problem using batch transferring by new approaches in meta-heuristic. Electronic Notes in Discrete Mathematics, 58, 143-150. Hajiaghaei-Keshteli, M., & Fard, A. M. F. (2018a). Sustainable closed-loop supply chain network design with discount supposition. Neural Computing and Applications, 1-35. Hajiaghaei-Keshteli, M., & Fathollahi-Fard, A. M. (2018b). A set of efficient heuristics and metaheuristics to solve a two-stage stochastic bi-level decision-making model for the distribution network problem. Computers & Industrial Engineering, 123, 378-395. Hajiaghaei-Keshteli, M., & Aminnayeri, M. (2014). Solving the integrated scheduling of production and rail transportation problem by Keshtel algorithm. Applied Soft Computing, 25, 184-203. Hajiaghaei-Keshteli, M. (2011). The allocation of customers to potential distribution centers in supply chain networks: GA and AIA approaches. Applied Soft Computing, 11(2), 2069-2078. Hajiaghaei-Keshteli, M., Molla-Alizadeh-Zavardehi, S., & Tavakkoli-Moghaddam, R. (2010). Addressing a nonlinear fixed-charge transportation problem using a spanning tree-based genetic algorithm. Computers & Industrial Engineering, 59(2), 259-271. Kirkpatrick, S., Gelatt, C. D., & Vecchi, M. P. (1983). Optimization by simulated annealing. science, 220(4598), 671-680.